My early musical tastes were country music, because that’s what my father listened to: old-style middle-of-the-road country music, Eddy Arnold, Ray Price, Loretta Lynn. I eventually found Johnny Cash on my own and became a rabid fan. I begged to stay up late to watch Johnny’s variety show; for Christmas my parents bought me a two-record greatest hits collection off TV. Soon I knew all the words to “Ring of Fire,” which was not hard, since there are only about nine of them. But I was a word-hungry kid, who wanted to be a writer from the time I learned to hold a pencil, and after using the Beatles as my bridge to rock ‘n’ roll (everyone’s bridge) it was the wordy guys I was most attracted to: Bob Dylan, Neil Young, Paul Simon. Later I’d have musicians I thought of as buddies or even girlfriends, but these three were more my rock ‘n’ roll Dads: they were a generation older, they had gravitas, wisdom. Bob was the twinkly-eyed trickster Dad whose strange utterances and private jokes were like riddles you couldn’t figure out: you wished he’d just come out and say it! And then on “Blood on the Tracks” he did that and became the Sad Dad, the too-much-information Dad. You felt his pain but kind of missed the jokes. Neil Young was the scary Dad, whose inscrutable-as-Dylan lyrics were less riddles than warnings it was frustrating not to be able to understand. It seemed like ancient voices were speaking through Neil, and not necessarily benevolent ones. Paul Simon was the explainer Dad, the Dad who knew everything, and whose explanations of that everything were always smart and patient but also a little condescending and superior. Even his attempts to lighten up had quote marks around them. Sorry for the obviousness of the choices but one thing it’s hard to argue with is greatness. And sometimes you just feel like a big dumb pop song. This is one of my favorites, written by Brill Building pros Jeff Barry and Ellie Greenwich (have you read Always Something in the Air? 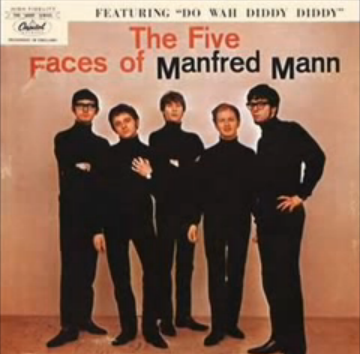 you should, it’s terrific), originally done by a group named the Exciters and much-covered since but best in this version by English singer Manfred Mann. What to make of this? Is the girl a little, you know, simple in the head? Manfred’s rough, Alex-Chilton-ish voice leaves no doubt that he at least considers it a carnal come-on. By the end of the song they are singing the words together because, um, true love doesn’t alter when it alteration finds? What’s never in doubt is that this is a 2 minute, 24 second blast of joy. As in many British Invasion songs, the singer sounds like he’s having so much fun it’s hard not to relax and enjoy yourself along with him. No stiff upper lip here! Manfred (or his record company) added the extra “diddy” to the title and also the street poetry of “we knew we was falling in love.” At least one of the songwriters is on record as preferring the more grammatical original version, but she just don’t understand. Back in Syracuse when I was in graduate school, we used to go hear a woman whose name I remember as Robin Fear perform at a local club, Tip-a-Few or Shiftys. (If Robin Fear wasn’t actually her name I want it to have been.) She dressed all in black and was sort of an oldies Billy Bragg, just her with an electric guitar and an amplifier. She was also, we knew from an interview in the New Times, openly gay. Part of her schtick was to sing songs strongly associated with male artists and never change the gender. She was great, and this song was one of her showstoppers. Every time she came to the “She looked good/she looked fine” lines my friend Rich and I would glance over at each other and nod knowingly. Every single time! It never got old.